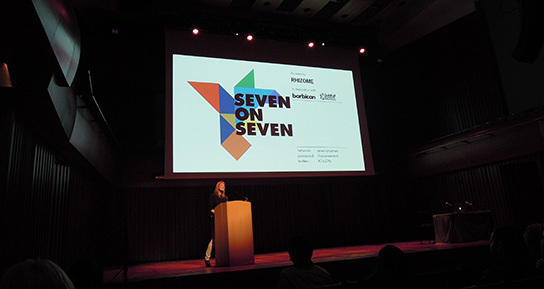 On October 27, 2013, Rhizome presented the first international edition of its flagship Seven on Seven program in London at Barbican Centre. Seven pairings of artists and technologists came together for two days in a collaborative sprint to create an app, an artwork, an argument, whatever they could imagine. The result: a web-based forum for anonymous geolocated conversation, an app that randomly selects one email from your Gmail Sent Mail folder and sends that to another user of the app, a set of icons that demarcate intended levels of privacy, and one leading artist's confession that he would like to become a cyborg.